Under the photo was the question, "Who is the real hero? Who deserves $20 million contracts?" Naturally, every person who commented said emphatically that the soldier is the hero. Some even bemoaned society in general. "The soldier is the hero. Without a doubt. I don't follow sports, so I don't know who that basketball player is. But if he had to be carried off because of cramps, either he is a big baby, or those aren't your everyday exercised-too-much cramps. They may very well be the kind I get...and mine will put you in a bed and keep you there. It's entirely possible that this player is refusing to let a disease keep him from doing what he loves. I once took a fall in front of a large gathering. Most did not know I have MS, and they assumed I came to a child's birthday party drunk. I was not yet in a place where I felt comfortable talking about my disease with strangers or casual acquaintances. They went on thinking I was a serious alcoholic for years...until I came to another birthday party in a wheelchair. Again...the soldier is the hero. Without a doubt. Very few of us have what it takes to make the sacrifices that soldier made. He deserves every accolade we can give him...starting with far better pay and benefits from a society that does not value his sacrifices anywhere near enough. But that photo of the player being carried off reminded me of that birthday party, and the snide and unkind things that were said about me for years afterwards. They were quick to judge. We should all strive to be less so." It's true what they say about chronic illness: it changes you. It changes how you view the world. 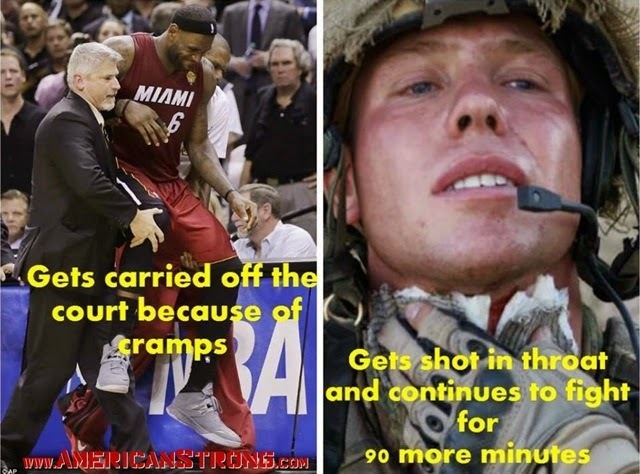 And it changed how I saw a photo of a basketball player being carried off a court because of cramps. Many of us in this world are wounded. Some wounds are just more obvious than others. And some of us aren't wounded heroes...we bear our wounds without any greater purpose being served. We're wounded anyway.